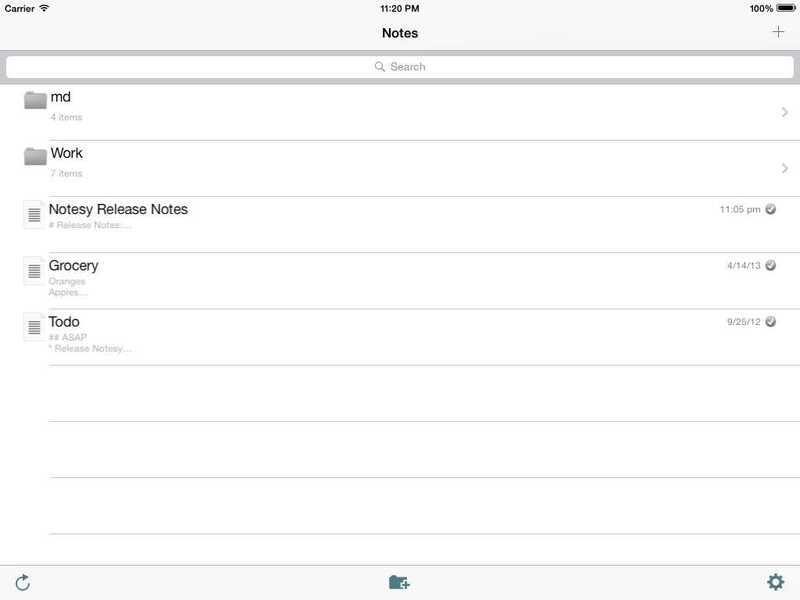 Notesy® is a note-taking app backed by the power of Dropbox. - Notesy supports accented characters: Chinese and Japanese, British Pound signs, and so on: see http://giantyak.com/notesy/notes-as-text-files.html or email me if you have any questions. - Please contact me via email at support@giantyak.com or on twitter.com @notesy before leaving a review here when you have an issue - I can't help you if you just leave a review. "Notesy's typography and ease of use have won me over. In fact, I used Notesy as the primary text editor for writing this book." — David Sparks in "iPad at Work"
"On the recommendation of commenters, I tried Notesy. It's now my main iPhone note-taking app" — Dr Drang. - Create, edit, rename, and delete notes at will, while you're on the go or at your computer. - Supports landscape and portait modes. - Your notes are stored as plain text files so you can work with them on your computer in your favorite programs. - Supports creation and deletion of folders and sub-folders. - Sophisticated (regular expressions and more) built-in searching so you can find the note you want, fast—even in sub-folders. - Your notes are synced to and from your Dropbox securely and automatically. 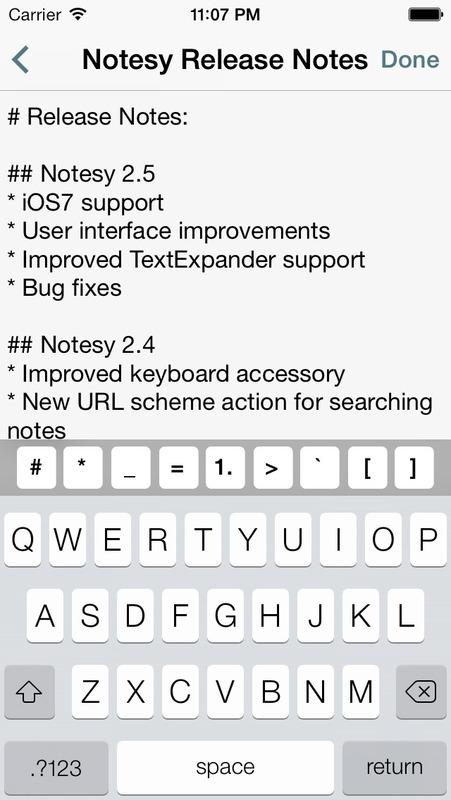 - Utilize Notesy from other apps using Notesy's feature-rich URL scheme. - No in-app advertising or purchases, and no monthly fees. - Full offline support, so you can get to your notes whenever and wherever you like: work on your notes on the plane and you can sync them to Dropbox when you arrive. - Keep your notes private by setting a pincode. 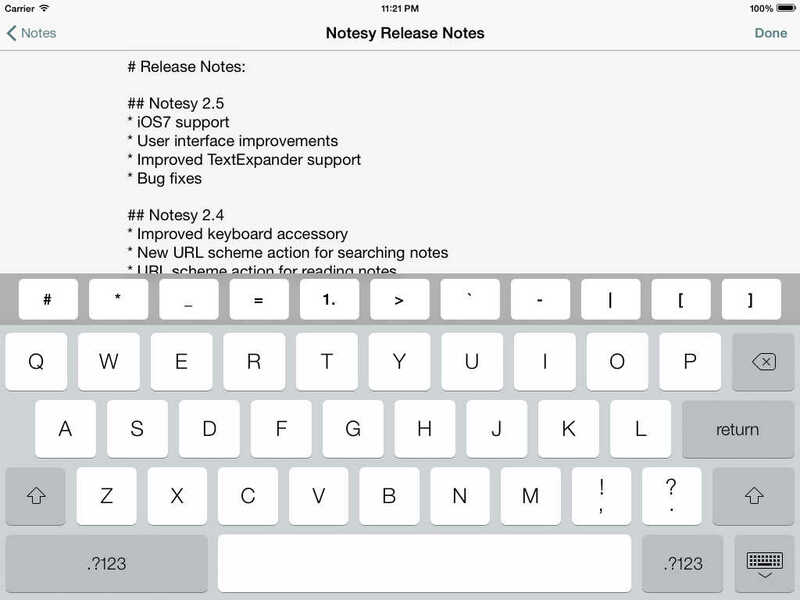 - Quickly jump to the next or previous note without backing out to the folder view. - Markdown support with a Markdown-themed accessory keyboard. - More screenshots at giantyak.com/notesy. - Recover deleted and previous revisions of your notes (feature only available through Dropbox's website until Dropbox add support for this to their API). 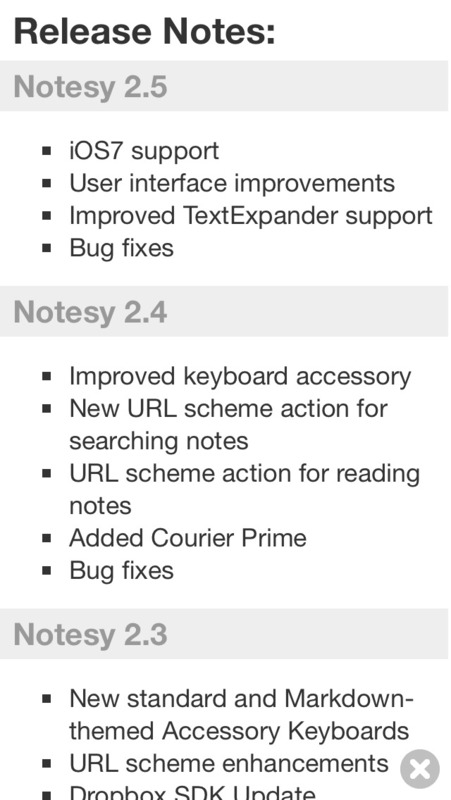 For documentation, hints and tips on how to get the most out of Notesy, check out http://giantyak.com/notesy. Dropbox (www.dropbox.com) is a fantastic file syncing utility. Create a file on one computer and it will “magically” appear on all your other computers and mobile devices with the Dropbox client installed. Even if you don't buy Notesy you should get yourself a free Dropbox account anyway. If you come across any VoiceOver or other issues, please let me know. You can reach me by email at support@giantyak.com or on twitter @notesy.